Its not an identical copy, it's a recreation of an old subject. This recreation will have texture unique just to this painting, a fingerprint that can never be repeated. My recreation will look similar but will have different texture, each knife stroke is unique and impossible to repeat. Each painting I create is one of a kind. If you have any questions, please ask. Customer satisfaction is our main goal. We speak English, Spanish, Russian and Hebrew. Note: All the paintings from The Deal Of The Day section comes rolled in a tube by default at no extra cost! Wedding Anniversary Gift - Rainy Wedding — Limited Edition Gift For Couple Wall Decor Print On Canvas By Leonid Afremov. When Dreams Come True — PALETTE KNlFE Oil Painting On Canvas By Leonid Afremov - Size: 54" x 32"
Well worth paying for ready to hang canvas, great job. I added hooks and wire within minutes. All three paintings are wonderful, thank you so much! Leonid replied to queries quickly and clearly. Although there was some issue with the first delivery, he was able to resend the painting to us at no extra cost. We appreciate that very much, Leonid. 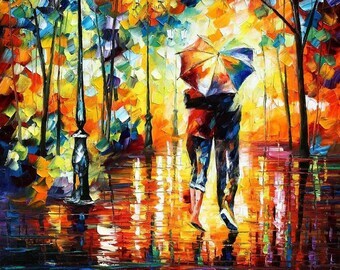 Thank you very much for your attention and interest in the art of Leonid Afremov. Customer satisfaction is my main goal. We will work with you to resolve any issue with the purchase. We will do anything in our power to make you a happy customer and maintain your loyalty, regardless of what the situation is. Every situation, return or exchange will be handled on individual basis. However, we do have certain rules and guidelines for returns and exchanges. · Returns are accepted only if you contact us and ship the merchandise back within 7 days from the delivery date. · We will pay the cost of the return shipping only if you received a wrong or damaged painting. If you simply do not like the painting or wish to return for any other reason, you must cover the shipping return shipping expenses. · If your order was shipped incomplete by mistake, please contact us and we will send the missing paintings ASAP. Playa Del Carmen office phone – +52 - 1 – 984 – 109-4781 ( 9am – 5pm central time, Monday – Friday) , please call this number if you want support in Spanish. Please remember that customer satisfaction is our main goal andwe will do anything possible to make you a happy customer. We have 3 shipping locations . Leonid Afremov travels quite a lot and when you order custom orders, the painting can be shipped form any of the mentioned locations or from anywhere where Leonid Afremov is located at the moment. We guarantee delivery in 45 days or less from the payment date. If you need your purchase to be delivered by a certain date, you must let us know as soon as you made the purchase so we place your order on higher priority. Promotional or discounted sales are automatically given lower priority than full priced sales. If you purchased a painting based on a promotion , you would need to pay additional charges for high priority and expedited shipping. All the paintings priced $139 are already discounted. If you need overnight shipping, it cost $35 to USA and Canada . 2 days shipping available to Central and South America for $40. 2 days shipping also available to West Europe for $45. notice to Buyers outside USA , Canada and Mexico: The declared value of the package will be the total payment amount minus the cost of transportation. The declaration statement will be “Online Sale” . We have 2 shipping locations, one in Playa Del Carmen, Quintana Roo ,Mexico and the second in Boca Raton Florida. 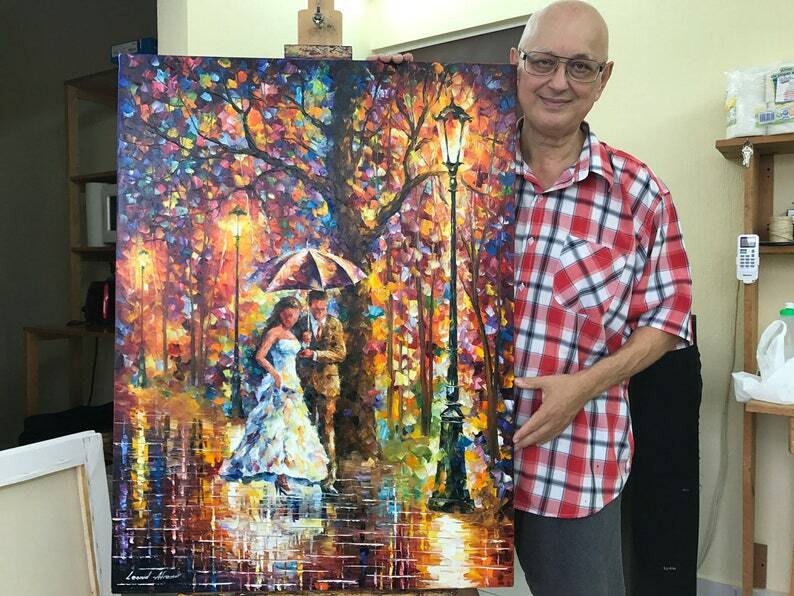 Leonid Afremov spends normally the winter and spring in Mexico and summers in Florida. Our offices in Mexico and Florida are closed and not operational for all the Jewish holidays , Christmas and New Years. Packages do not get picked up during the following Jewish holidays Rosh ha Shana, Yom Kipur, Sukot, Simhat Tora , Hanuka, Purim, Passover and Shavuot as well as Chirtmas Eve, Christmas Day, New Years Eve, New Years Day. The Mexican office is also closed on September 16th (independce day), Constitution Day - February 6, The Birthday of Benito Juarez - March 19, Good Friday - April 6, Labor Day - May 1 and Mexican Revolution Day - November 19. We provide free shipping of stretched paintings only to USA , Canada and Mexico and up to size 30"x40" . Shipping of larger size painting than 30"X40" stretched would require additional shipping fees. Please ask about the fees, they vary by size of painting and destination. Shipping of stretched paintings outside North America requires additional shipping fees. The fee depends on the size of painting and country of destination. Australia has restrictions on importing wood, we recommend Australians not to select stretching. Please ask about the additional shipping fees for stretched paintings to your country. You can order custom painting or order customise of any painting from my shop! No, we don't make or sell decorative frames and can only get your painting gallery wrapped/ready to hang on your request. When using the word "frame" in correspondence, we refer to the wood frame used for stretching the painting on top. How much does it cost to have the painting delivered Gallery Wrapped and ready to hang? Having your painting Gallery Wrapped will cost you $29. If you order doesn't include this upgrade, the item will be delivered unframed in a tube. If you forgot to add the gallery wrapped upgrade, contact me and I will send you a link to buy gallery wrapped upgrade. We provide free delivery all over the world with a 30-day shipping guarantee. You can order custom painting from me. Just contact me and I will give you all the details. If you wish changes to an existing painting, it's not a problem. Small changes like changing clothing and hair color on figures do not cost extra. You need to request such changes in the customer comments section while making the order. Yes, this is my official Etsy shop. Kiss Under The Rain 2 — Limited Edition Romantic Kisses Couple Wall Art Print On Canvas By Leonid Afremov.